This tutorial discusses the specifics of the explicit finite difference method as it is applied to option pricing. Example code implementing the explicit method in MATLAB and used to price a simple option is given in the Explicit Method - A MATLAB Implementation tutorial. The Finite Difference Methods tutorial covers general mathematical concepts behind finite diffence methods and should be read before this tutorial. Alternative finite difference methods, namely the implicit method and the Crank-Nicolson method, are covered in companion tutorials. where the indices i and j represent nodes on the pricing grid. Figure 1 is a pictorial representation of Equation 1. They show that given values for ƒi, j+1, ƒi, j and ƒi, j-1 then values for ƒi-1, j can explicitly (and easily) be calculated. In the option pricing framework, Equation 1 (and hence Figure 1) shows that given the value of the option at the boundary conditions (and most noticably at expiry) then all interior points of the pricing grid can be calculated by using a backwards induction approach to step backwards through time. That is, given the option payoff at expiry nodes then the prices δt before expiry can be calulated, then from those prices the value 2δt before expiry can be calculated, and working iteratively backwards through time until the option price at grid nodes for t=0 (i.e. today) can be calulated. This matrix notation is used in the Explicit Method - A MATLAB Implementation tutorial. Two important questions to ask about any numerical algorithm are when is it stable? and if it's stable then how fast does it converge? (An iterative algorithm that is unstable will lead to the calculation of ever increasing numbers that will at some point approach infinity. On the other hand, a stable algorithm will converge to a finite solution. Typically the faster that finite solution is reached the better the algorithm. The rate of convergence of the algorithm is directly related to the truncation error introduced when approximating the partial derivatives. Hence the explicit method converges at the rates of Ο(δt) and Ο(δS2). This is the same convergence rate as the implicit method, but slower than the Crank-Nicolson method. The backwards induction technique used to step the explicit method backwards through time is ideally suited to pricing options that include the possibility of early exercise. 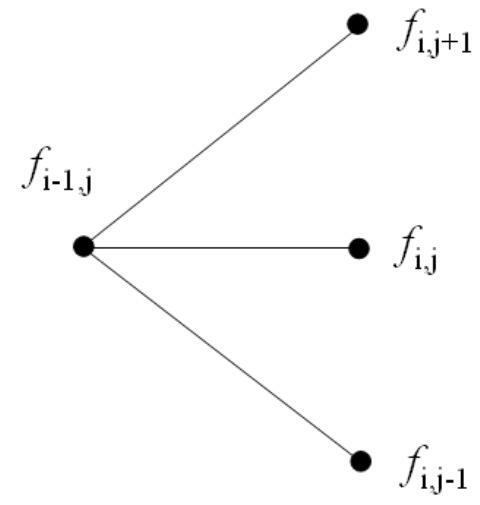 At each node, rather than use the value calculated from Equation 1 (or Equation 3) that value is compared to the intrinsic value and the maximum of the two if used, i.e.